Is fear one of those emotions that is always negative? Is fear a part of our ego controlling us? A part of me thinks yes but I also think fear is necessary to learn and to grow. There is so much in this life that is unknown that it seems almost natural to have fear within yourself. I found the excerpt below by Eckhart Tolle and it immediately spoke to me…it felt as if the words were written about where I am at this time in my life. I used to be this person that was so social and constantly pursuing new relationships whether they be romantic or friendships. I have become this wallflower that almost finds difficulty in starting relationships because I feel as if I can’t relate to many people. I continually think about myself and diving into my deeper consciousness and I ache to study the world around me. I am not insulting people for being different than myself….I have just found that I have not crossed paths with many (in this geographic area) that are experiencing this same part of the life journey. Sometimes not being able to discuss these things because of not having the company or not being able to express it vocally can bring on fear. I do fear the unknown but not in a way that is crippling to my existence. I have learned that pretty much everything in this world is unknown so it is really a natural way of life. I have just not been able to fully accept certain parts of these unknowns….I am unsure of what happens after we die and the thought alone can be very terrifying. I knowing that dying is a part of living and everyone dies but I do fear that I may not ever be reunited with those that I love or that I end up in some sort of world all by myself….see, it is the fear of the unknown. Again, this fear seems natural though and even though it can feel overwhelming I think it is important to question these things because it gives you a better understanding of life and of self. I love the way that I think even if it can sometimes feel completely maddening…..like I am living in my own internal mental ward. Dear Diane, Perfect words at a perfect time. 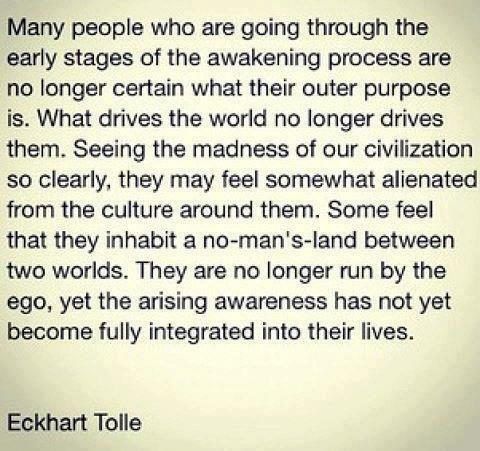 I needed to re-read these words by Eckhart because I feel this way often. Thank you for posting this. Love the quote! Keep searching for the peace you so desire, it is there and it is the quenching of the thirst we are all born with.